Second Saturdays each month during season from 6 to 9 pm, all the Galleries in Crayton Cove are open. Guess-Fisher Gallery is located in the back of Phil Fisher Gallery, offering 33 years of experience in custom picture framing, fine art gifts and the working studio space of Natalie Guess, a fine art batik artist for over 36 years. Her gallery/studio offers the art enthusiast the opportunity to see the batik process in various stages, which helps to understand its unique appeal. She has taken this ancient medium, more common in countries such as Africa and Indonesia, and pushed its boundaries in the world of fine art. 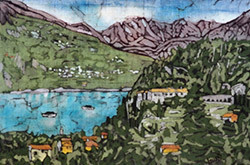 Working with hot wax and fabric dyes on silk or cotton, this medium creates unique views of recognizable subject-matter portraying Naples and various scenes from her travels. Natalie’s work can be found in numerous books, publications and world-wide collections. Her handling of fiber in batik as a fine art form is pioneering a unique niche within the Naples art world, and beyond. A 1979 graduate of Drake University in Pottery and Business, she has taught numerous classes and created many works of art in clay over the years. Her slab-built sculptures and pots can be found amidst their art-filled spaces, as well. Along with Natalie’s work, there are some Kimberly Hambor infra-red photography prints, pottery by Jim Rice, pet portraits in acrylic by Tianna Fisher and paintings by Phil Fisher. A Naples artist for over 45 years, Phil Fisher, known for his brilliant, sun-washed colors and depictions of Naples scenery, paints with his cheerful color palette, well-known to Neapolitan art lovers and collectors. Working in oils and various mediums, he is recognized most for his watercolors. He creates an emotional connection with his brush that draws the viewer in to experience his feelings for the subject. He makes good use of this strength in color when interpreting his views of the various countries traveled. Representing these professional artists and located in Crayton Cove, this gallery is a favorite “must do” when in Old Naples. Both galleries offer inspirational renditions of the paradise we experience in Naples and the opportunity to take home a lasting memory created by one of Naples’ finest artists. Please come by and enjoy a leisurely visit. An artist who loves working with her hands, Natalie Guess is a natural for the rare art form known as batik. Originating in Egypt and found in pyramidal tombs, it is an art form most popular in Indonesia, Africa and Sri Lanka, today. The word "batik" means "wax writing". True batik involves the painting of hot clear wax on the silk or cotton fabric to resist the dyes of color that the fabric is immersed in. This is done one color at a time until the work of art is finished. The "crackle" or "webbing" effect is created by crunching the waxed fabric in the hands prior to putting in the dye. 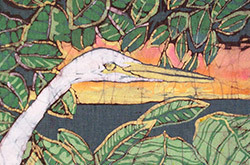 Natalie is one of a small number of professional fine art batik artist across the United States. She has worked in this medium for more than 32 years and finds that the possibilities are exciting and endless. She appreciates the natural environment of Florida and reflects this in her work. Her particular attention to shadows gives her pieces a drama and depth that renders itself especially striking in the batik medium. It has a look unlike any other art form.